Wagyu Beef from Japan is also knows as Kobe Beef. Exotic Meat Market offers Japanese Wagyu Beef, Grade A 5 in the USA since 2006. The first online retail store to offer Japanese Wagyu Beef on the Internet. Kobe beef in Japan is a registered trademark of the Kobe Beef Marketing and Distribution Promotion Association. Filet Mignon Steak - Japanese Wagyu Beef 10 Oz. Filet Mignon Steak - Japanese Wagyu Beef 6 Oz. 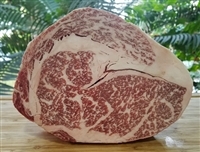 Japanese Wagyu Tenderloin Roast, A-5 - BMS 12 - 10 Lbs. Japanese Wagyu Tenderloin Roast, A-5 - BMS 12 - 8 Lbs. Japanese Wagyu Tenderloin Roast, A-5 - BMS 12 - 9 Lbs. New York Steak - Japanese Wagyu 10 Oz. New York Steak - Japanese Wagyu 11 Oz. New York Steak - Japanese Wagyu 12 Oz. New York Steak - Japanese Wagyu 13 Oz. New York Steak - Japanese Wagyu 14 Oz. New York Steak - Japanese Wagyu 15 Oz. New York Steak - Japanese Wagyu 16 Oz. New York Steak - Japanese Wagyu 17 Oz. New York Steak - Japanese Wagyu 18 Oz. New York Steak - Japanese Wagyu 19 Oz. New York Steak - Japanese Wagyu 20 Oz. New York Steak - Japanese Wagyu 21 Oz. New York Steak - Japanese Wagyu 22 Oz. New York Steak - Japanese Wagyu 23 Oz. New York Steak - Japanese Wagyu 24 Oz. New York Steak - Japanese Wagyu 8 Oz. New York Steak - Japanese Wagyu 9 Oz. Rib Eye Steak - Japanese Wagyu 10 Oz. Rib Eye Steak - Japanese Wagyu 11 Oz. Rib Eye Steak - Japanese Wagyu 12 Oz. Rib Eye Steak - Japanese Wagyu 13 Oz. Rib Eye Steak - Japanese Wagyu 14 Oz. Rib Eye Steak - Japanese Wagyu 15 Oz. Rib Eye Steak - Japanese Wagyu 16 Oz. Rib Eye Steak - Japanese Wagyu 17 Oz. Rib Eye Steak - Japanese Wagyu 18 Oz. Rib Eye Steak - Japanese Wagyu 19 Oz. Rib Eye Steak - Japanese Wagyu 20 Oz. Rib Eye Steak - Japanese Wagyu 21 Oz. Rib Eye Steak - Japanese Wagyu 22 Oz. Rib Eye Steak - Japanese Wagyu 23 Oz. Rib Eye Steak - Japanese Wagyu 24 Oz. Rib Eye Steak - Japanese Wagyu 8 Oz. Rib Eye Steak - Japanese Wagyu 9 Oz.